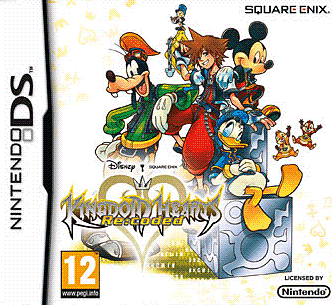 The worlds of Square-Enix and Disney collide once more as Kingdom Hearts makes a visually stunning return to the DS. With plenty of famous Disney-themed worlds to visit and huge monsters to slice up with your keyblade, this is a good way to make the long wait for Kingdom Hearts 3 a little less painful. Re:coded picks up where the second game left off, as Jiminy Cricket finds a number of bugs in his digital journal of the first game's events. Receiving a mysterious message, he sends spiky-haired hero Sora (or a digital version of him) into the journal to investigate. The glitches in the code are represented by black blocks, which can be smashed for items and experience - but they're far from the only problem Sora has to overcome. It's a bit confusing at first, especially if this is your first experience of the Kingdom Hearts series, but once all the talky stuff is over you can get on with the business of smashing up blocks. Not too many, though - you'll need to keep some so Sora can climb up them to reach hidden treasures on higher ground. After a short while, you'll encounter the series' regular enemies, the Heartless, who have their own agenda in the digital realm. They come in all shapes and sizes, but they're all defeated in the same way - swing away with your keyblade to knock them about a bit before finishing them off with one of a selection of spectacular special moves. You unlock more and more as you progress, with some requiring elaborate button combos to pull off. It's ultra-satisfying to nail a powerful finishing move, especially when you're dealing with the tricky bosses that pop up every now and again. The only problem when you're battling several enemies is that the camera gets confused just who or what it should be pointing at, and it's all too easy to get smacked around by an enemy you can't see. You can move the camera with the stylus, though, or snap it to Sora's back by tapping the right shoulder button. It's not an ideal solution but after a while you get used to it. If you've played the first Kingdom Hearts, the locations will all be familiar, but this time you'll be looking at them from a fresh perspective. We'd never have guessed Wonderland would suddenly turn into a third-person rail-shooter, nor that Square-Enix would take a cue from Mario and offer up some 2D platforming. For a while, it even turns into a turn-based RPG. These short sequences are a welcome break from all the hacking and yakking, adding some much needed variety to proceedings. It's also fun to hunt down the computer chips that can enhance Sora's abilities. They slot into a circuit board called the Stat Matrix, where you can link circuits to double the power of any chips placed between the two. Depending on the chips you use or where you place them, this ‘dual processing' offers Sora faster level upgrades, more health, or a command meter that recharges quicker. You can also synthesise attacks, adding elemental powers to your strikes. By the later stages, you'll be making mincemeat of the smaller enemies and even the bigger ones present little problem to a fully-specced Sora. 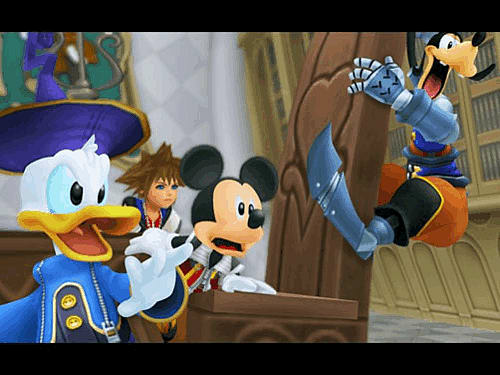 The plot starts to pick up, and Donald Duck and Goofy join the fray, making the combat even more exciting. Things can get busy in the heat of battle, though, so it pays to have a few health potions handy. The story is a decent length, and there are extra-tough challenges to return to once you're done. 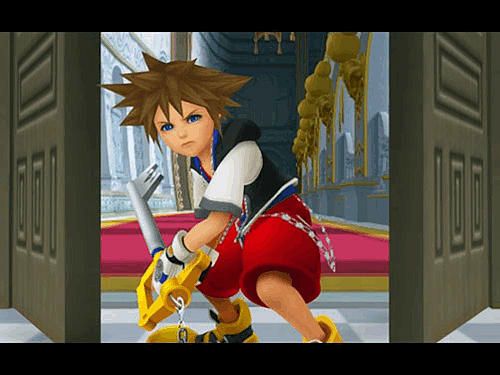 If you've played the original Kingdom Hearts recently, you might find it all a bit samey, but fans will enjoy the story's twists and turns, and the frantic and colourful combat is entertaining enough to keep newcomers happy.